We always book our trips to June Lake through June Lake Accommodations. Their staff are professional, friendly and very helpful. Highly recommend! The mattress in the bedroom wasn't as comfortable as I would have liked, but everything else was excellent! Very nice, spacious unit, clean and decor was very pleasant. THE VIEWS ARE MAGNIFICENT! MANAGER/OWNER RESPONSE: The mattress and box springs are less than 3 years old. After seeing your review of the unit, it was discovered that there was a manufacturer's defect in the box springs. The box springs have since been replaced as of August 2017. We agree that a good night's sleep is important for a restful vacation. Great! The condo was excellent and comfortable. It's been great. Since everything was online there was very little contact but it was very easy. Just keep doing what you're doing! Looking forward to doing it again with the wife. Maybe in October? 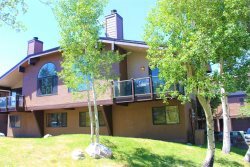 It's the most beautiful spot in the June Lake loop, and the nicest condominiums in the area. It's the perfect getaway to relax, fish, eat, and enjoy family time. This was the best experience I've had with renting vacation property. The staff was knowledgeable and was extremely friendly! Will be referring this site to friends and family! Very friendly, we were incredibly surprised by how easy it was. The girl had also pointed out the local brewery and tiger bar to us which was a big help! Everything was clean, ready, and welcoming when we got there. Very much looking forward to staying there again. This was my second time staying there and first time actually reserving it myself, and I very much doubt it'll be my last! The team was extremely accommodating during checkout. We love the property! it was very comfortable and well appointed! Sierra was very friendly and helpful. Interlaken has been our favorite place to stay at June Lake ever since we saw it from the lift way back in the 80's. The property is beautiful and the condos are a treasure. The view from the living room is probably the best we have ever seen at any mountain property. We have skied Oregon, New Mexico, Colorado, Nevada, Utah and California and we keep coming back to June Mountain. We are already planning a return trip in October to do some hiking and further explore the area. Your Gals are wonderful and truly kind. They were thorough, efficient and friendly. I, my wife and 3 children (ages 25-32), spouse of child, and two visiting friends of my sons had a wonderful time skiing, looking out the balcony and visiting the JLB and Tiger Bar. We used the Jacuzzi, too. The unit was in great condition and had plenty of room to spread out. Your team is very helpful and very friendly. I enjoyed working with them. Condominium was in very good condition. Had pretty much everything that we needed. Our family had a very enjoyable stay. The staff at the rental agency was very friendly and very helpful and answered every question quickly, friendly and efficiently. It was snowing when we were trying to get out of town. Where a problem with our chains and young lady in the office happen to have bolt cutters to help us. That goes beyond your normal expectations! Super helpful and friendly staff, especially Sierra! We had lots of questions and she was always great! We had a great time, loved the property and June lake in particular!